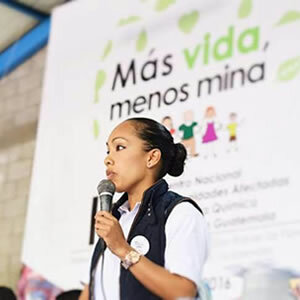 Jennifer is a young, 30-year old Mormon woman who has worked for the Centro de Acción Legal Ambiental y Social en Guatemala (Guatemalan Centre for Legal, Environmental and Social Action or CALAS according to its Spanish acronym) for 10 years. CALAS is a non-governmental organisation (NGO) that defends environmental human rights. It supports environmental human rights defenders that are criminalised by the state or forces linked to corporations from extractivist industries. She is an educator specialised in human rights and is currently studying law and legal and social sciences. When she started to volunteer at the organisation in 2009, however, she did not have much experience or knowledge on the issue. Back then, she was invited to participate in the research for a report that only CALAS produces: the national report on the violation of the human rights of environmentalists in Guatemala. That is where she came into direct contact with human rights and began her work as an activist. After two years of work and training as a general assistant, Jennifer became the coordinator of CALAS’ department of political and citizen participation, the position she holds today. Her direct contact with the communities makes her more aware of the importance of fighting for human rights, especially in a country that went through 36 years of internal armed conflict and where over half of the population lives in poverty or extreme poverty. Guatemalan women are particularly affected by this situation, since, as Jennifer affirms, the discrimination against them is tripled: “because they are women, because they are poor and because they are indigenous”. When Jennifer speaks about violence in Central America, her voice is strong and confident. One of her most shocking statements is: “Fighting for human rights in my country means you know you are going to die, that they might kill you”. Unfortunately, this is no exaggeration. Together with Honduras, Guatemala is one of the countries in the region with the highest number of assassinations of human rights defenders in recent years. According to the CIDH’s 2015 report on human right rights in Guatemala, between 2000 and 2014, 174 human rights defenders were assassinated. Defending life involves assuming risks. And it is about and based on this reality that she speaks. The details of the violence that Jennifer’s colleagues and friends have suffered due to their environmental work are horrifying. On 4 September 2008, for example, CALAS director Yuri Melini suffered an attempt on his life in which he was shot 16 times. And like him, many other people have been the target of violent attacks or were – and continue to be – threatened with death. Since the year 2000, there has been an increase in conflicts related to mining, hydroelectric dam and monocropping projects that have negative impacts on ancestral territories and the resources found in them. CALAS carries out the important task of monitoring private and state sectors in Guatemala and defending concrete cases of human and environmental rights violations and has even succeeded in halting some mining operations. This explains why they are under constant threat. With a small team of five, the organisation is currently pursuing more than one hundred lawsuits. CALAS works in a context where human rights defenders are highly criminalised. In September 2016, Yuri Melini’s 21-year old assistant Jeremi Barrios was killed by two gunshots to the head. His death was a heavy blow to the human rights movement in the country, the organisation and especially his friends and family. “Our organisation is very vulnerable. We know that something can happen to us at any moment. When they killed Jeremi, I realised that the work of young people is never recognised. As human rights defenders and organisations, we have to learn to value youths. We must not wait for people to die to recognise their work”. Defending the environment in Central American countries involves fighting not only against foreign mining corporations, but also the state. In general, the state does not respect the community’s will, nor does it assume the role of defending the national common good by carefully monitoring, for example, the concession of mining permits and guaranteeing that its citizens’ rights are protected. Many of the cases that end in serious conflicts, violence and the imprisonment of rights defenders are related to the modus operandi of foreign extractivist corporations that flout national legal barriers by simulating popular consultations or, even worse, unscrupulously deceiving the communities from whom they need to acquire land or who will be directly affected by their operations. In 1995 Guatemala confirmed the constitutionality of the consultation of indigenous peoples. In article 6 of the Agreement on Identity and Rights of Indigenous Peoples, the state defends the need to “secure the approval of the indigenous communities prior to the implementation of any project for the exploitation of natural resources which might affect the subsistence and way of life of the communities […]”. However, there are no real legal guarantees to ensure compliance. Moreover, communities exposed to devastating damage do not always recognise themselves as indigenous, which becomes an impediment to accessing the legal defence of their territory and requires them to seek other mechanisms of action. This is where popular resistance takes on great importance and religion has assumed, in some way, a leading role in strengthening social movements that resist the destruction and appropriation of territories. According to Jennifer, the Catholic Church in Guatemala is increasingly open to the issue of human rights and the environment. This can be seen in the creation, by the Diocese of Santa Rosa de Lima (Municipality of Santa Rosa, Guatemala), of the Comisión Diocesana en Defensa de la Naturaleza (CODIDENA, or Diocesan Committee in Defence of Nature), which is coordinated by people from the community. “There are also evangelists who support our work. It is nice to see how the Mayan cosmovision and Western religion have come together in the case of Jalapa and Santa Rosa (in the southeast of Guatemala)” around the mining conflicts in the area. In addition to becoming a reference on environmental and extractivist issues, CALAS is one of the few organisations that takes mining cases to the Supreme Court of Justice and the Constitutional Court. “No other organisation dares to pursue cases as openly as CALAS does, and this caused us to lose funding…in 2012, we were left practically without salaries. No one wanted to support us”. This critical situation almost led them to close after 18 years of intense work. Jennifer explains that this was also due to the international smear campaign that the government of the ex-president Álvaro Colom (2008-2012) helped promote outside the country. The Embassy of the Netherlands and the European Union were some of the important donors that withdrew their support. But then, something that Jennifer interprets as a miracle or a divine blessing happened: the European Union started to support them again by funding a small project that “brought them back to life”. After that, several European churches began to offer financial support, including the Lutheran Church, the Catholic Church of Ireland, the Netherlands and Switzerland. “Little by little, help arrived from places we least expected”. Jennifer is a Mormon, but a different kind of Mormon. “We, Mormons, distance ourselves from the media. We’re conservative. At church, no one talks about climate, human rights, politics, these things that are important. They only talk about love. Religion is important, but Jesus did not stay holed up between four walls. Religion is something that should push us to do things better, do things well done and fight for what we believe is just”. This is what Jennifer does every day: fight for what she believes in during the numerous hours she dedicates to community work and defending human and environmental rights with vulnerable groups. She divides up her time – including Saturdays and Sundays – between caring for her one-year-old son, her university studies and her activism as a human rights defender. “Fighting is important. We must fight and not lose faith because of the good things we have”.